So you are considering using rainwater as a backup or emergency water supply. Rainwater is a great solution for both however there are things that need to be considered prior to installation. One major item for consideration is whether you have public water supply to your property. If you have public water supply anywhere located on your property, then you must have backflow prevention properly installed. This avoids the situation where rainwater mixes with city water into the public supply or the public supply mixing with the rainwater you have in your cistern. If the rainwater system is being installed for non-potable use, prior to any conversion to using in the home for potable use, the backflow prevention device must be installed. If you do not see this as part of the quote for the installation or conversion, then you as the property owner, should be asking where that information is. This expense can be a larger fixed expense due to needing a plumber or someone who is licensed to perform this connection (some irrigation licensing does have this endorsement) and having to pay their rates on the length of time it takes them to perform the installation as they generally charge by the hour as well as trip charges in some cases. While rainwater is the safest form of water available to us, this is prior to it hitting the ground and/or touching other surfaces. Rainwater can become contaminated just like any other water source. In order to ensure the rainwater is safe for drinking or potable use in the home, a filtration system which includes separate filters and a UV light should be used. This ensures that the water is properly disinfected for potable use. We recommend gutter foam in the gutters, a first flush diverter as well as using the filtration system because the cleaner the water is going in, the cleaner it will be for it’s intended use. In some cases, tree limbs may also need to be trimmed to allow for less organic matter in the water. In conclusion, rainwater is a great source for primary water supply, emergency water supply or a backup water supply. Please do your research and ensure you abide by your local regulations for rainwater harvesting in your area before you install a system. Water safety is all of our concern and responsibility. As always, comments and/or questions are always relevant and welcome. Categories: Backflow Prevention, College Station, First Flush Diverter, Gutter Foam, Rainwater Collection, Rainwater Harvesting, UV Light, Water Filtration | Permalink. When you drink from your tap, refrigerator, or bottled water do you think about TDS in your cup? Water standards are in place that enable our cities to keep our drinking water safe and within the correct limits. However, it is often interesting to do your own test just to see what the results are. Dissolved solids refer to any minerals, salts, metals, cations or anions dissolved in water. Total dissolved solids (TDS) typically comprise inorganic salts (principally calcium, magnesium, potassium, sodium, bicarbonates, chlorides, and sulfates) and some small amounts of organic matter that are dissolved in water. The current EPA TDS standards & info (taken from http://www.tdsmeter.com/education?id=0018): In terms of Total Dissolved Solids (TDS), in the U.S., the Environmental Protection Agency (EPA) advises against consuming water containing more than 500mg/liter, otherwise known as 500 parts per million (ppm) of TDS, although many health specialists believe that ideal drinking water should be under 50 ppm or lower. The average tap water in America contains approximately 350 ppm of TDS although it is not uncommon for municipal or local water supplies to exceed this. If TDS levels exceed 1000mg/L, however, it is generally considered harmful to human health and should not be consumed. We recently were told by a customer that they performed a TDS test on their water. We had installed 2 rainwater systems on their property. This property has a small herd of cattle and while we were installing there was dust settling all over our tools and equipment that the animals stirred up daily. The guttering has normal screen and both systems have first flush diverters on them. The customer told us that they tested bottled water at 3 TDS. One of their systems had 1.3 TDS and the other had 1.8 TDS. They were amazed at the results that the rainwater they collected has less Total Dissolved Solids than the bottled water. By no means are we saying this water is drinkable straight out of the cistern. We are purely recounting what the customer told us. We have seen this test performed on other types of water as well with very similar results. With proper treatment the water from the cistern will be safe to drink. It also requires less treatment in many cases than well water. We encourage educating yourself on the subject of Total Dissolved Solids in drinking water. There are multiple resources out there discussing the subject in depth. There are many inexpensive options out there as well allowing you to test your own water in the privacy of your own home if you are curious enough to do so. Your city’s municipal water supply is supposed to supply you with information about their annual results of the drinking supply. This is often on their website or sent to their customers. We are lucky to live in a country that enables us access to clean, safe drinking water. Categories: College Station, Drinking Water, Rainwater Collection, Rainwater Harvesting | Permalink. It is always a pleasure for us to go out and educate potential clients. This potential client was delighted to know that the rainwater tanks he had purchased did not have to go right by the barn as he originally thought they would have to. In our original visit, we proposed the tanks go under the trees. Since they were polyurethane, this does two things. Protects the tanks from the sun and weather, and keeps the water cooler since the tanks set in the shade. It also camouflages the tanks somewhat as well as they blend into the scenery instead of being out in the open. Below are a few pics of our initial tank placement prior to installation. We put in quite a bit of hard work on both these systems, solving multiple concerns as we worked. The end result was a drier barn arena, water collecting from two separate gutters into two separate tanks, submersible pumps installed in each for on demand water use. We think we did pretty well at surpassing the customer’s requests. The tank furthest away had the shortest plumbing run but it has all the standard features we include: tank foundation, first flush diverter installed on treated lumber, water level monitor, system cleanout drain, spigot and overflow. The end result of several days of planning, trenching and gluing pvc is below. We can’t begin to explain how rewarding it is to go out and serve people by helping them conserve our most precious resource, water. Bringing their rainwater system dreams to life is a privilege we do not take lightly. Categories: 1500 Gallon, Cistern, Drought Solution, Landscape Irrigation, non-potable water use, Plant Irrigation, Polyethylene, Rainwater, Rainwater Collection, Rainwater Harvesting, Tanks, Uncategorized | Permalink. We always enjoy the privilege our customers allow us by sharing their personal property space with us. We get to go into their yards and land and see what their needs are. We get to bring their ‘rainwater vision’ to life. Below are a few before the installation pictures. These were taken 3 weeks prior to the installation. The tanks are made locally in our state of Texas so we are thrilled to be part of keeping Texans working. The tank the customer chose was a light brown which is a custom color (dark green and black are standard colors that are readily in stock) so we had to order and wait for it to be produced. It was well worth the wait as you will see in pictures further down. This is one view of the site the customer had in mind as to the optimal location for the tank. We agreed with the location for what the customer will be using this for. They want good water for plants and for his fish tanks. Below is another view of the tank location prior to the installation. For this installation, we had to level out the pad location and remove this one small tree to give us enough space for the tank pad we planned. 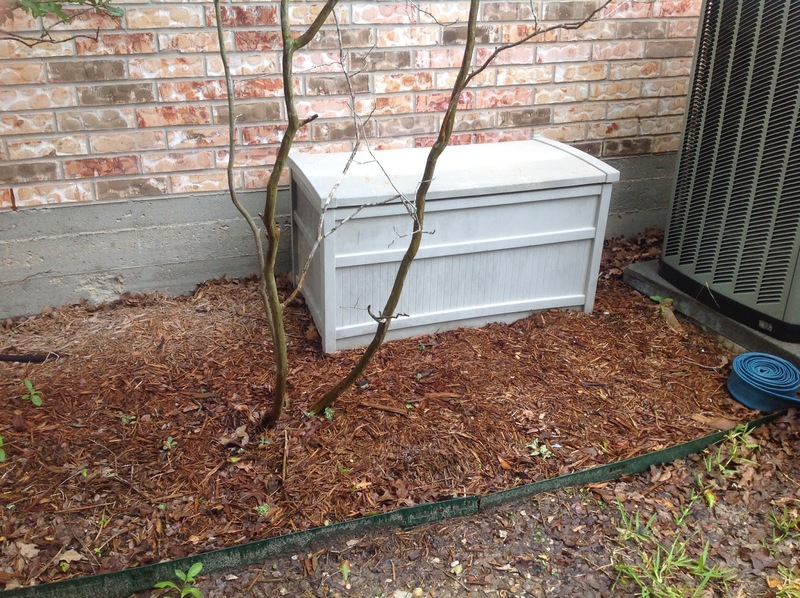 In addition, the customer had a run of gutter put on the front of the house to add to the collection amount they would be able to get for this tank. Based on the roof space we are collecting from, we estimate the customer should get 488 gallons from one inch of rain. So this 500 gallon polyethylene tank should be large enough for 1 inch of rain collection. The overflow is into the flowerbed similar to where it was going prior. Below is one of the pictures of the completed installation. So as you can see above, there is a nice rectangular pad around the tank. Gravel base and sand are in the pad under the tank. There is a water level monitor calibrated for empty and full. To the left is the water coming into the tank and the First Flush Diverter. To the right is the overflow. This tank and pad matches very nicely to the existing landscaping and home exterior. We are extremely pleased with the look of this system. 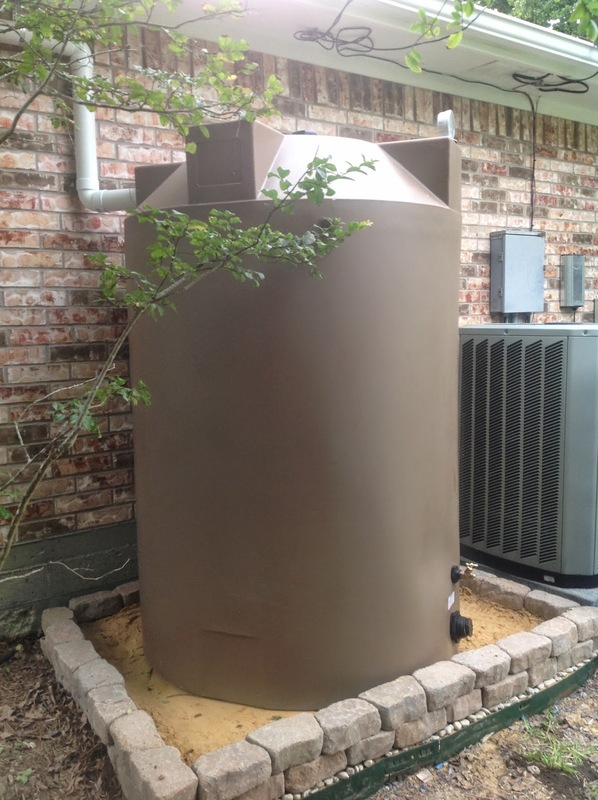 Given the fact that College Station averages 35 inches of rain annually and the estimation that the customer will collect 488 gallons with one inch of rain, this customer should be able to collect 17,080 gallons over the course of the year. This tank will overflow, especially in large rainfall events but at least they have taken the first step in conservation. We can always come back in at a later date and trench to a larger tank. We would replace the existing overflow pipe and run that to a larger tank as the new overflow location and then that tank would also have an overflow. So if this customer decides they want to capture more at some point, adding on is very easily accomplished. This is about the largest tank we would put in this location. Any larger would not fit properly in the space allotted, and would look out of place due to the diameter and height required to store the volume of water. Stay tuned for more pictures as we keep helping customers conserve water in the Brazos Valley and surrounding areas in Texas! Categories: 500 Gallon, Cistern, Drought Solution, First Flush Diverter, Polyethylene, Rainwater Harvesting, Water collection, Water Conservation, Water Restrictions Solution | Permalink. 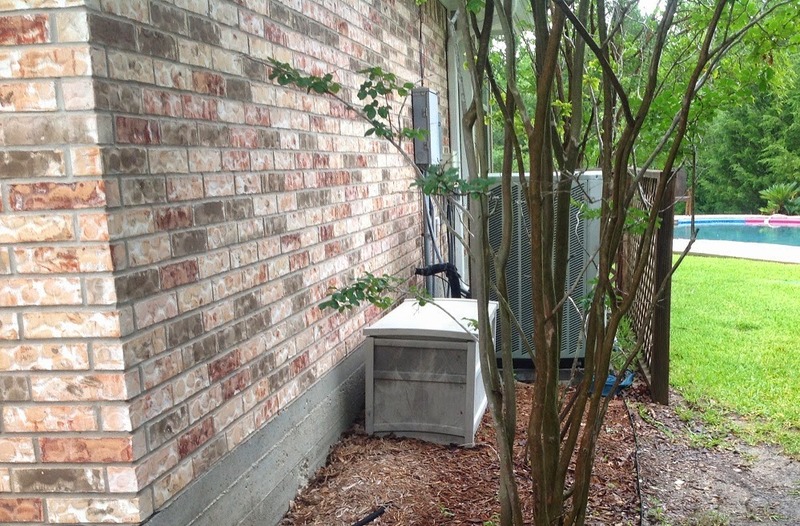 Recently we were asked to measure for a local College Station apartment complex for the rainwater harvesting potential. We knew there would be plenty of roof space for harvesting but the sheer amount of water that can be collected was mind blowing, even for us since we work with these numbers every day. If we collect from every surface in this apartment complex, one inch of rain harvests 53,181 gallons of rainwater. Unfortunately it will not be feasible to capture from every surface since we have limited space for tanks to hold the water. On average (taken from data from the past 10 years) we have had 35 inches of rain annually in College Station, Texas. This means that we could capture 1.8 million gallons of water from this one apartment complex alone in town. This is a staggering amount of water that can be harvested and used for numerous purposes. Landscaping is the first use that comes to mind. Filling pools or fountains to beautify the property is another. Potable water use is also an option for drinking, showering and washing clothes etc. It is more of a challenge to retrofit an existing complex, but it can be done. We are going to propose capturing from the roofs nearest the areas the owner would like to see the water be used for since that makes the most sense from an economical standpoint. It seems a shame to waste the rest, but since we simply don’t have an empty lot to put a 50,000 gallon tank on the property, we are faced with doing the best we can with the allotted space. It is easier to plan for rainwater harvesting with new construction because you can plan where the tanks and everything will go from the start. Retention ponds and drainage can be placed and set where those can be collection points as well into tanks to reduce evaporation issues. I am thrilled to see business owners starting to step up and attempt to at least see what it would cost to increase their green footprint. Food for thought is that maybe one day, in areas of severe drought, water of this magnitude could be harvested not only for use, but to be purchased by the cities for treatment and usage for consumption. Categories: Apartment Complex, Apartment Housing, Brazos Valley, Catchment Surface, College Station, Rainwater Harvesting, Rainwater Runoff, Stormwater Management | Permalink. Recent rainfall in the Brazos Valley has put a small dent in the drought conditions. 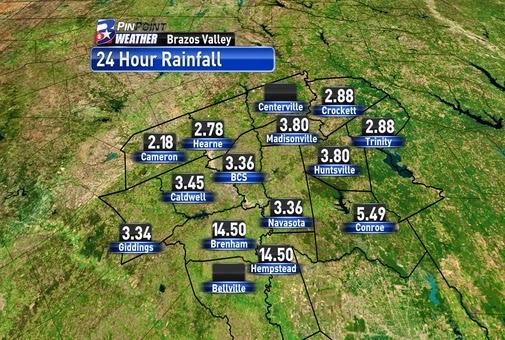 The graphic below shows the rainfall totals on May 13th for 24 hours as shown on KBTX.com website. We aren’t out of the woods yet with summer fast approaching. According to this article on KBTX.com, the ‘rainfall deficit for the year has been cut from around 7 inches to just 3.37″ …’ Easterwood airport officially received 5.44″ of rainfall up to May 14th. This would bring the total above on a 1500 sq ft roof to 5084 gallons of rain that could have been captured. The Bryan/College Station area generally (using the past 10 years as a guideline) getting around 3 inches or more in the wetter months and with July and August being the driest months at 2″ or less, we hopefully will get another 3-4 inches before the hottest months. So you still have time to get a system in to capture any water that falls to use for your lawn, outdoor plants and/or garden, livestock or pets, and even for potable use. Rainwater harvesting costs for a system is generally similar to drilling a well with one main advantage. Rainwater is the purest form of water until it hits the ground. So you can have clean water from the start with a harvesting system in place and a few safeguards installed to ensure a trustworthy, clean and sanitary source for water for you and your family. Categories: Brazos Valley, Drought, non-potable water use, potable water use, Rainfall, Rainwater Collection, Rainwater Harvesting | Permalink. Today I happened across an article that made me proud to be a Texan. With drought issues being more and more prevalent, every drop of water that can be conserved should be conserved. It makes sense to find ways to not only make it easier for water to be conserved but also save people money when they do opt to conserve. 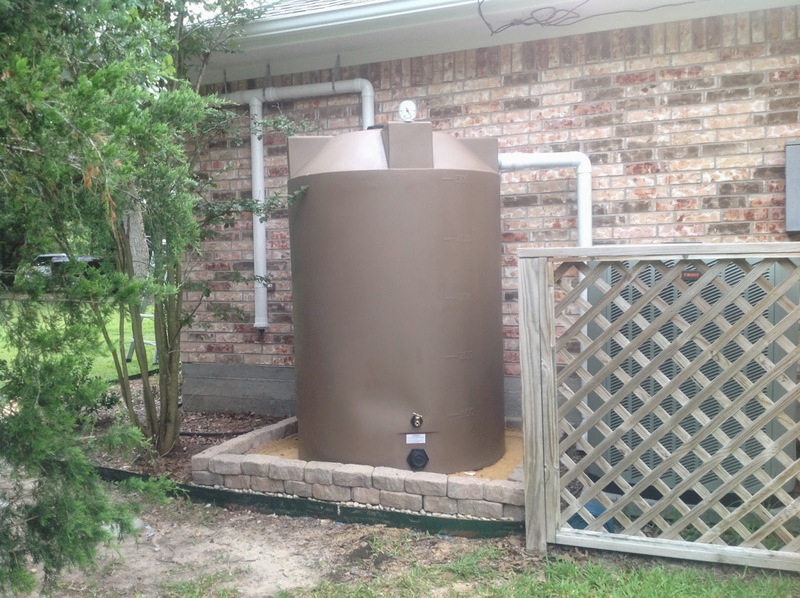 Below is the link to the article I came across but as a brief synopsis, the City of San Marcos, Texas is putting a rebate in place for Rainwater Harvesting system installation of up to $5000 for homeowners and up to $20,000 (conditions apply) for commercial installations. This is a giant leap that I hope for all of our sakes, especially our children, that other Texas cities decide to implement in some type of manner to encourage water conservation. You are welcome to read this article for yourself here. Categories: Agricultural, City of San Marcos, Commercial, Drought, Homeowner, Rainwater Harvesting, Rebates, Texas, Water Conservation | Permalink.